Tag Helpers are special feature to enable server side code to create, update and render HTML in view file. They are said to be evaluation of Html Helpers. Although, Html Helpers do exist, yet Tag Helpers are very popular as they are just additional attributes in existing Html elements and are very easy for UI designers or front stack developers to understand. asp-controller: is used to specify controller to be used. asp-action: is used to specify action method to be used. asp-area: is used to specify area to be used. asp-for: is used to specify property to be used. Generally, this property is bond to specified control. asp-route: is used to specify named route instead of controller and action method. asp-validation-for: is used to specify property to be validated. asp-validation-summary:is used to specify mode of validation summary to be used. asp-antiforgery: is used to enable or disable antiforgery. asp-append-version: is used to add version number to resource, so if there is any change in resource then version number is also changed. It ensures that in case of any change one resource is not used from cache. AnchorTagHelper is used with a tag. It allows data element to be mapped a tag through asp-area, asp-controller, asp-action, asp-route to specify area, controller, action method and route. We can also pass parameters asp-route- construct. FormTagHelper is used with form tag. It allows to specify controller, action method. It also allows to specify route name instead of controller and action. Furthermore, it provides services to handle cross-site request forgery. It is important to remember that on submit action form uses name fields of inner objects to create response body. ImageTagHelper is used with img tag. It allows to specify asp-append-version, which is used to address image cache problem. InputTagHelper is used with input tag. It allows data element to be mapped input tag through asp-for attribute. While input tag type is decided through data element type and data annotation. While data validation rules are applied through data annotation. For example element data type Boolen will make type="checkbox", String will make type="text", DateTime will make type="datetime"and Byte, Integer, Single, Double will make type="number". Similarly data annotation EmailAddress will make type="email" , Url will make type="url", HiddenInput will make type="hidden", Phone will make type="tel", Password will make type="password", Date will make type="date"and Time will make type="time". LabelTagHelper is used with label tag. It allows data element to be mapped input tag through asp-for attribute. It uses Display data annotation value of specified data element to display label. If Display attribute has not been applied then element name is used. LinkTagHelper is used with link tag. It allows to control link behavior, for example specify and control source and fallback source. OptionTagHelper is used with option tag in select tag. It allows to manipulate option elements individually by SelectTagHelper. ScriptTagHelper is used with script tag. It allows to control script block behavior, for example specify and control source and fallback source. SelectTagHelper is used with select tag. It allows data element to be mapped select tag and option through asp-for and asp-items attributes, asp-for is used to specify selected value element and asp-items is used to specify list to be bounded with options. While data validation rules are applied through data annotation. TextAreaTagHelper is used with textarea tag. It allows data element to be mapped textarea tag through asp-for attribute. While data validation rules are applied through data annotation. ValidationMessageTagHelper is used with span tag. It allows validation messages mapped to span tag through asp-validation-for attribute. ValidationSummaryTagHelper is used with div tag. It allows all validation messages mapped to div tag filtered through asp-validation-summary attribute. Possible values for asp-validation-summary as: All, ModelOnly, None. CacheTagHelper is used to cache content for any section of a view. It is not applied to any standard HTML tags, rather than, it is a server side control. It uses MemoryCache to store. Time interval after which cached data will expire using expires-after. Time interval after which cached data will expire if not used using expires-sliding. Fixed time interval on which cached data will expire using expires-on. Based on some key or model data using vary-by. priority allow to specify priority of cached content. When system runs out of memory, it starts clearing cached contents, in such case items are cleared priority wise. We use Microsoft.Extensions.Caching.Memory.CacheItemPriority to specify priority. We can use different attributes together to have mixed mode as per our requirements. But it is important to remember that there will be cached copy for each combination and it can lead to use a huge memory. It is our responsibility to define Unique Cache Key, otherwise content will be overwritten. This distributed cache service will be registered through Startup.ConfigureServices. If we do not configure any distributed cache server then ASP.NET Core will use default Memory Cache. We can use SqlServerCache or any other Cache like Radis Cache as per requirements. Please refer to Working with a Distributed Cache for more details. EnvironmentTagHelper is a server side Tag Helper which is used to specify different HTML handling to be used for different environment. It becomes very handy when we have to specify different URLs for links and scripts for different environments. Please refer to Working with Multiple Environments for more details. We can find related example in _Layout.cshtml. Let's discuss how to implementation of generic CSV Writer, which may take input any List and return a CSV string or write to specified file if specified. Although, this is a generic C# implementation and can be used in any .NET Framework supporting generics, yet we are going to discuss this with .NET Core. We are going to use .NET Core Console Application from previous discussion Welcome to .NET Core Console Application. We are going to add a new class CsvWriter in DotNetCore.ConsoleApplication. 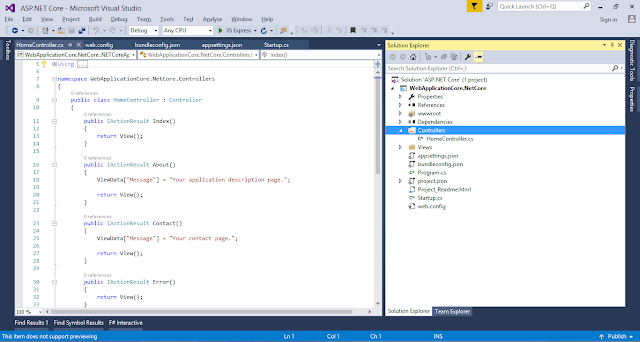 Open existing Solution in Visual Studio 2015. Now add a new class CsvWriter.cs. Open Add New Item Screen through DotNetCore.ConsoleApplication Context Menu of Common folder >> Add >> Class >> Installed >> .NET Core >> Class. Creates and returns generated CSV. Creates and returns generated CSV and saves the generated CSV to specified path. Creates CSV header line if includeHeader is sent true. Creates a CSV line for given type of object. Creates a CSV line for given list of string by joining them delimated by comma. Adds provided value item to processed list used to create CSV line. Adds provided string list as single item to processed list used to create CSV line. Adds provided string array as single item to processed list used to create CSV line. Adds provided string value item to processed list used to create CSV line. Processes the provided data to handle double qoutes and comma value. If we do not apply escape sequences then they can croupt data. Writes the generated CSV data to file. We are going to add a new class TestVM in DotNetCore.ConsoleApplication. Now add a new class TestVM.cs. Update Program.cs to initialize List<TestVM> with dummy data and call CsvWriter. Press F5 or Debug Menu >> Start Debugging or Start Console Application Button on Toolbar to start application in debugging mode. It will start application console in debug mode. It will generate test.csv at given path. Therefore at C:\ASP.NET Core\CSV Writer\DotNetCore\ConsoleApplication.NetCore\bin\Debug\netcoreapp1.0. We have placed sample code for this session in ".NET Core CSV Writer_Code.zip" in https://aspdotnetcore.codeplex.com/SourceControl/latest CodePlex repository. Let’s create our first .NET Core Console Application. We assume that we already have Visual Studio 2015 Update 3 and .NET Core 1.0.0 - VS 2015 Tooling Preview 2. If you have not installed .NET Core yet then I may recommend you to follow our initial discussion How to install .NET Core 1.0. Alternatively you can follow Microsoft Official Site directly. Open New Project Screen through menu File >> New >> Project. Select Blank Solution through Installed >> Templates >> Other Projects >> Visual Studio Solutions. Name solution as “DotNetCore”. Set suitable location as “C:\ASP.NET Core\Welcome To .NET Core 1.0\”. It will create a new solution. We are going to add a new Console Application. Open Add New Project Screen through Solution Context Menu >> Add >> New Project or File >> New >> Project. Select Class Console Application (.NET Core) through Installed >> Templates >> Visual C# >> .NET Core. Set suitable location as “C:\ASP.NET Core\Welcome To .NET Core 1.0\DotNetCore\” (selected by default to solution root). Add Write greetings and ReadKey in Program.cs. Console.ReadKey(); holds the program from termination until a key is pressed. 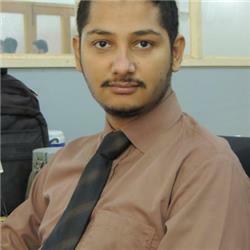 Make project self contained and it will generate exe file which is directly executable. Please refer to Self Contained Deployment for more details. Framework Dependent Deployment allows to build and run application as dll, and in this mode application is executed through dotnet.exe. In this case a single distributable is created which is executed system provided runtime components. By default, Visual Studio 2015 uses this mode. If we observe build directory, then it contains dlls and config files only. Open command line prompt or Power Shell. Go to output folder containing ConsoleApplication.NetCore.dll. In our example we have path as: C:\ASP.NET Core\Welcome To .NET Core 1.0\DotNetCore\ConsoleApplication.NetCore\bin\Debug\netcoreapp1.0. Self Contained Deployment allows to build and distribute application as an exe, which is execuatable directly. In this case an OS dependent disreputable is created which is executed contains all required runtime components. We may have to do few or more configuration changes in project.json in dependencies, runtimes and others as per requirements. In our case we have to just remove "type": "platform" from dependencies and to add runtimes section. If we observe build directory, then it contains exe along with dlls and config files only. Or directly double click ConsoleApplication.NetCore.exe in Windows Explorer. We have placed sample code for this session in "Welcome To .NET Core Console Application_Code.zip" and "Welcome To .NET Core Console Application_SelfContained_Code.zip" in https://aspdotnetcore.codeplex.com/SourceControl/latest CodePlex repository. Controller is heart of MVC. It is a glue between View and Model. It accepts request as input through Action Methods, while an action method may generate some response (for example list page and details page) or perform some task (for example add, update and delete). In simple, we can call Controller a group of related Action Methods with set of applicable rules. And it is responsible to manipulate data in form of Models and rendering of views as final result. It is not required, but we have few conventions, which are followed throughout community but in actual they are not required. They are just followed as best practice. A Controller has Controller Suffix. This convention is only followed to avoid name conflict and to make it easier to identify Controllers. A Controller has to be in Controller Folder. We know that final output assembly have no concern of folder structure used in code. So this convention is solely in practice for code maintenance. View helper method allows controller to specify view and model to be used. If an action method just returns an object or a collection of objects then returned data is formatted based on request parameters. For ASP.NET Core Json is default option. Process request parameters and map them to data provider components. We may also consider InputFormatter and Parameter Mapping in this area. It may also involve input Data Validation. For more details on Model Binding and Parameter Mapping, please refer to ASP.NET Core 1.0 MVC Model. We will discuss InputFormatter and Data Validation in detail in future sessions. These data provider components can be any repository, any data service or any business logic component. For .NET Core it is recommended to use data provider components as services, and these services are generally made available to Controller using Dependency Injection. We will discuss Dependency Injection in detail in future sessions. Process response data and map them to final response output. Depending upon type of application, action method selects the response type. In normal MVC application, we mostly cater with IActionResult. We may return view. Please refer to ASP.NET Core 1.0 MVC View for more details about Views. For further details, please refer to official documentation at: https://docs.asp.net/en/latest/mvc/controllers/index.html. Let's discuss how to export data or list in CSV format. For this purpose, we will implement Custom Response Formatter CsvOutputFormatter and a generic helper CsvWriter to convert any List of objects to CSV format. We are going to extend our application from last discussion CRUD operations in ASP.NET Core 1.0 MVC Application Part 7. Now add a new folder Common in WebApplicationCore.NetCore. Open Context Menu of project >> Add >> New Folder. Now add a new class CsvWriter.cs in Common folder in WebApplicationCore.NetCore. Open Add New Item Screen through Solution Context Menu of Common folder >> Add >> Class >> Installed >> .NET Core >> Class. It will add a new class CsvWriter.cs in Common folder. Add required implementation in CsvWriter to generate CSV string for provided list of objects. CsvWriter is a helper class and it provides facility to generate CSV of provided List of objects. We have changed it for our requirements, please refer to .NET Core CSV Writer for more details. Now add a new class CsvOutputFormatter.cs in Common folder in WebApplicationCore.NetCore. It will add a new class CsvOutputFormatter.cs in Common folder. Inherent existing output formatter base class TextOutputFormatter, OutputFormatter or StreamOutputFormatter as per requirement. For example, JsonOutputFormatter and XmlSerializerOutputFormatter inherit TextOutputFormatter. Although, this approach provides many features out of box due to base class, yet it makes formatter little heavier. Alternatively, Implement IOutputFormatter interface and we just have to implement two methods: CanWriteResult and WriteAsync. Where CanWriteResult is used to check if this formatter can be used to process response or not, while WriteAsync method performs actual processing on response. We have used this approach as it is simple and efficient. ASP.NET Core provisions us to implement Custom Response Formatter and Custom Request Formatter separately. In this way, we can use any kind of Response and Request formatter as per requirements. We will discuss Custom Response and Request Formatter in detail in future sessions. We also need to register CsvOutputFormatter, for this purpose, we register it in ConfigureServices method of Startup class with MVC service as Setup Action. In simple, we have to add CsvOutputFormatter in collection of OutputFormatters of MVC Service. Now add a new action method GetCsv in WebApplicationCore.NetCore.ContactController class. It is similar to Index Action Method with exception that it returns List<ContactListVM> and has [Produces("text/csv")] attribute to mark content type to enforce ustilization of CsvOutputFormatter. We are explicitly checking content type == "text/csv" in CanWriteResult. Add Get CSV link in Contract\Index.cshtml for GetCsv action method. Press F5 or Debug Menu >> Start Debugging or Start IIS Express Button on Toolbar to start application in debugging mode. It will show Home Page in browser. Click Contact List Menu Open to open Contact List Page. Click Get CSV link it will show open save dialog. Open file, it will open CSV file in default program, most probably in Excel or Notepad. We have placed sample code for this session in "CRUD operations in ASP.NET Core 1.0 MVC Application Part 8_Code.zip" in https://aspdotnetcore.codeplex.com/SourceControl/latest CodePlex repository. View is said to be UI part of a web application. In simple, it can be called HTML Template which is used to generate final HTML. It is important to note that Razor code is executed server side to generate final HTML of a page with Help of Razor Engine. ASP.NET Core MVC Views has .cshtml extension (for C# ) and by default these files are stored in Views folder. Generally, controller has its own folder with views for related controller action methods. Action Specific View are called from some action method and they are generally stored in view folder related controller and by default have same name as of action method. We can call views of different name by specifying view name and from different folder by specifying full path from an action method. Generally full qualified path is like “~/Views/FolderPath/ViewName.cshtml” or with relative path “../FolderPath/ViewName.cshtml”. Please refer to ASP.NET Core 1.0 MVC Controller for more details about Controllers. Partial View are said to be reusable components and very similar to web control in ASP.Net Web Forms. They can also be used to decompose complex structures into smaller parts. But main purpose of them is reusability. Partial View is rendered within another view. Partial views has same extension like view .cshtml and it is not required but a practice to start partical view with underscore (_). Technically, partial view is same as normal view but we make its Layout null. Furthermore, special views like _ViewStart are not executed for partial views. We can add partial view into a view with @Html.Partial(“_ViewName”), while partial view can have relative or full qualified path. And if we have strongly typed partial view, then we may add partial view with @Html.Partial(“_ViewName”, dataModel).It is important to note that partial views can be nested. So we can add a partial view in another partial view. Within each view or partial view, relative paths are always relative to that view, not the root or parent view. We are not allowed to have partial views loop cycle (circular nesting). Layout Views are said to be main structure and they are very similar to Master Page in ASP.NET Web Forms. Layout View defines main structure of a web application and may contain header, menu, footer and page content area as per requirements. They facilitate us to define and handle all these at one place. It is common to have at least one layout view, but we can have more than one layout views to meet different requirements. For example, we can have different layouts for front office and back office. Or to have different layout for popups. It is customary to have layout view as “_Layout.cshtml” in Shared Folder of Views. We set layout of a page with following statement in view or in _ViewStart.cshtml. Layout view contain special tag @RenderBody() in which main called view is added and @RenderSection() which specifies section to be rendered in view. We will discuss sections in detail in future sessions. _ViewStart.cshtml is used to execute common tasks like setting Layout View. The statements listed in _ViewStart.cshtml are run before every view except layouts, and partial views. Generally, _ViewStart.cshtml is located in the Views folder. Like _ViewImports.cshtml every folder can have _ViewStart.cshtml. These are executed from parent to child in sequence. View Discovery in the process to identify the viewed called by an action method or a partial view during rendering of final Html. If a view name is not specified or name without path is specified then this process determines which view file will be used based on predefined steps. For example, when an action returns the View without view name then action name is used as the view name. Similarly, runtime looks for a controller-specific view first, then looks for matching view name in the Shared folder. And when view is specified with a full qualified path then only specific view file is used. We can pass data to views using loosely typed data collections: ViewData and ViewBag. ViewData is a dictionary object accessed through string keys. We can store and retrieve objects in it, and we may need to cast them to a specific type. We can use ViewData to pass data from a controller to views, as well as within views (and partial views and layouts). String data can be stored and used directly, without the need for a cast. The ViewBag property is a wrapper around ViewData that provides a dynamic view over that collection. It is not a separate collection. The ViewBag objects provides dynamic access to the objects stored in ViewData. This can be more convenient to work with, since it doesn’t require casting. Although ViewBag is just a wraper on ViewData collection and we can mix and match between ViewData and ViewBag without any issue, yet it is better to use one approach in a project. Strongly Typed View has a specific a model type in the view, and it is mapped to an instance of this type passed to the view from the action as parameter. We can specify a model for a view using the @model directive then the instance sent to the view can be accessed in a strongly-typed manner using @Model as object of specified type.It is highly practiced and is most recommended option to pass data as it gives lot of benefits like robustness, compilation protection over other approaches. Dynamic Views are hybrid of both Strongly Typed and Loosely Typed Views. In this kind of view model is not declared but have a model instance passed to them. But @model and it's properties can be used in view dynamically. In this case we don't have compilation protection or IntelliSense. If the property doesn’t exist, then application crashes at runtime. For further details, please refer to official documentation at: https://docs.asp.net/en/latest/mvc/views/index.html. Model is an object representing data item and set of applicable operations. It can be of simple native type like: integer, string or complex structure like class, array. Ideally, model represents state of an application. It is said to be data holder in MVC structure. For data centric applications, Model is representation of an Entity and is generally used to transport data between Database and View through controller. For example, in Entity Framework or any ORM, Model Classes represent underlying entities. ViewModels can be subset of a single model or multiple models and they are designed to fulfill data requirements of view without effecting actual model. For example, for a list page, we may use a ViewModel which has as few fields as few column as required on list page instead of having all of fields. On the other hand, for a complex view we can have a composite ViewModel having fields from different Models or additional fields. When we bind Model with View then they can make model details available in rendered Html, but with usage of ViewModel we can hide actual model details. Therefor they provide additional security. It increase performance by minimizing data transfer to and from view. Model Binding is based on key value pair mapping and this mapping is not case sensitive, Data Elements are mapped using reflection and recursion. For data mapping following collections are checked order wise: Form, Route and then Query String. So for parameter data mapping first of all Form values are parsed, if parameter is not found in Form then Route Values are check, Even if value not found then Query String is check. If a value not found in any of these then it is tried to set it to null. Data Annotation is used to decorate a model. These are Attribute and used to add additional details or metadata to model. This additional set of information can be used for a variety of purposes like: Labeling, Data Validation, Data Formatting, and Data Mapping. Basically all validation data annotations are driven from ValidationAttribute, which is driven from Attribute. Please refer to CRUD operations in ASP.NET Core 1.0 MVC Application Part 4 to see most of data annotations in action. We can provide custom message as per requirements through ErrorMessage and if we don't provide ErrorMessage then default message is used. We can also use localization through resource files to centrally control labels and messages in single or in multiple languages. For this purpose, we specify resource through ErrorMessageResourceType parameter and resource filed with ErrorMessageResourceName parameter. We can also define new data annotation to perform both of client side and server side validations. We will discuss creating new data annotations in detail in future sessions. RequiredAttribute inherits from ValidationAttribute and specifies that a data field value is required. StringLengthAttribute inherits from ValidationAttribute and specifies the minimum and maximum length of characters that are allowed in a data field. MinLengthAttribute inherits from ValidationAttribute and specifies the minimum length of array or string data. MaxLengthAttribute inherits from ValidationAttribute and specifies the maximum length of array or string data. DataTypeAttribute inherits from ValidationAttribute and specifies the name of an additional type to associate with a data field. We also have specific purpose data validators like CreditCard, EmailAddress, FileExtensions, Phone, Url driven from DataTypeAttribute. They are used to validate string values for specific format acceptable for credit card number, email address, file extensions, phone number and Urls. DisplayAttribute inherits from Attribute and provides a general-purpose attribute that lets you specify localizable strings. This is basically used to display label instead of validation. DisplayFormatAttribute inherits from Attribute and specifies how data fields are displayed and formatted. CompareAttribute inherits from ValidationAttribute and specifies that value of a data filed is compared tothe value of other data field. EditableAttribute inherits from Attribute and specifies that data field is editable or not. CustomValidationAttribute inherits from ValidationAttribute and allows to specify a custom validation method that is used to validate a property or class instance. Where we can define our custom method to perform complex task like validating unique email, address validation or any complex validation activity. ASP.NET Core supports JSON as default data format for request, and we can also use XML by using Microsoft.AspNetCore.Mvc.Formatters.Xml package. Furthermore, we can have many other formats like CSV or any other as per requirements with custom implementations. We will discuss Response Data Formatting in detail in future sessions. For further details, please refer to official documentation at: https://docs.asp.net/en/latest/mvc/models/index.html.